characters that stack protection on hit are ridiculous. Hounds tooth is the same for ships. No toon should be able to 1 v 5. Um. Most characters can 1v5. Depends on what 5 characters youre bringing there. And 5 cls lead rebels against a nest is one of the worst possible options. Correction: terrible squad selection and strategy vs Nest. As soon as I saw the title of the post I knew it would be about nest . Nest isn't that hard to beat with that team. Just hit her with Han's special (Deadeye) approximately twice - first, and then after Nest takes a turn. She'll be dead. Don't hit her in between, it won't do anything and you'll probably delay her taking a turn. This is true, assuming you have other targets to hit. Unfortunately, once you get to this point, it's pretty much a guaranteed timeout. You can still win this. R2, CLS and OB all have moves that don't attack. You need to get Nest to take a turn to get rid of the protection. Then hit as hard as you can. OB's hand-wave move drains tm. Luke's non-attack move gives him another turn where he then drains tm. Not worth mentioning CLS's ability since it gives him a full turn. It's not about not attacking here, it's about not using the moves that remove tm (Like CLS's or OB's special or Han's basic attack). R2 is there. Drop stealth to prevent death from constant counters. Lots of ways to stun her around for when stealth drops to also prevent death by counter. Only real problem is all the tm removal on the CLS squad. Needs to be managed carefully. Biggest things I see would be to never use CLS special attack unless Nest just went, and to try to only use Han's basic when Nest has less than 50% tm so his specials are available when she has more than 50% tm. Nothing to be done about CLS removing tm on his basic. How many more of these threads are we going to see? True. If you get to the point pictured above, you're screwed. Nest requires some minimal planning ahead. Disagree that you're done if you get to that point. Just have a fair chance of timing out. Careful management still leaves you a chance to win (assuming you have a couple minutes left when you reach this point). @op Make sure you aren't stacking potency on anyone so you don't get any tm removal and this 5 on 1 is much easier. When I saw the title of this thread I thought that it would be a complaint about a character model being bad. I leave this thread disappointed. CLS and Han go too often and remove too much TM to allow Nest to move at that stage. I'm not about to re-mod to lower potency and hope Nest resists - that's not a strategy. Easier to just kill her quickly and early. Actually modding for low potency is, in truth, a bonafide strategy for CLS squads. (resisted effects = tm for rebels with CLS zeta). Now you still have to worry about gaining more tm than your opponent, but with low potency at least you aren't likely to achieve a tm lock. I can beat her on my worst day, and i run palp with nihlus. Go check out my nerf post. Regardless (and I have a g12+ Nest) - I still think her kit is very poorly designed and a symptom of lazy programming. To be able to stand there and take repeated hits from some of the hardest hitting characters in the game is just completely ridiculous. And yes, I beat her and know how. That's not the point - she should still be changed. Why? She was already figured out before Revan came on the scene - and once he's a little more available she's not going to be fooling anyone. That's like complaining that Bastila needs to be nerfed because here zeta lead stops debuff dependent teams (hello resistance, EP lead) from getting going. If beating Nest requires letting Nest reset her protection (it does), then using a TMR team against her is folly. And that fault is laid squarely at the feet of the attacker. Not Nest's kit. But dumb AI is not a problem unique to Nest - the AI is pretty dumb overall. It’s not ridiculous. They made a character and there’s an easy way to beat her. It’s another example of people trying to shove a square peg through a round hole. Sorry your team can’t beat every team. Another "Nerf Nest" thread complete with a screenshot of Nest holding off virtually the exact team she was built to counter. Cool. To be fair, she is a hard counter to any team that has TM reduction, stun or doesn't have numerous non-attack basics or specials for each member of the team. She's not a counter to 1 team - she's a hard counter to several and dozens of individual characters. Can she be beat? Of course. Just because she can be beat, doesn't make it a good kit. So, what makes the kit bad? Or indicative of lazy programming? And what would make it better? So, what makes the kit bad? That she is a hard counter to so many teams/characters - especially the iconic ones and those used the most. It's also a bad kit because it is handled particularly poorly by the AI (yes, the AI stinks in general - except Revan. Amazingly, the AI plays his kit brilliantly.) Also that she is so "plug and play" friendly. She can help almost any team, be it Traya, Rebels, NS, Scoundrel, etc. All one has to do is look at TW (before they messed with it) - you could find maxed Nest in several defensive and offensive teams. At a time when CG had stated that they were trying to move away from "plug and play" toons to more team-synergy based teams, she is the complete opposite of that. For those that still doubt, just play the final tier of the Galactic Bounties event. And yes, I have beaten it - with all g12+ BH. Again, beatable doesn't mean "good"
Or indicative of lazy programming? Some of that has to do with what's outlined above (extremely poor vs. AI, the fact that she can be used anywhere, despite CG's move away from that type of character) - but the way her kit does end up becoming completely unbeatable for several teams (or types of teams) screams that they also didn't play test her kit well enough - as I honestly don't think she was ever intended to be able to make so many characters/teams so worthless (It's the usual CG Hanlon's razor). It also is nonsenscial that if a stunned character can't dodge (thank God they finally fixed that), that a stunned character can resist all forms of damage. Honestly, I think she was rushed out and they simply didn't playtest her kit very well. Finally, fixing it would be simple. Just allow a very small percentage of the damage to trickle through her protection up. That allows to keep her offensive kit, her tanky-ess and most of her design, while still making her subject to the laws of the universe that everyone/everything else follows (i.e. that something doesn't become stronger by being hit over and over again...except the afore mentioned Hulk). It's CG's game - they can design/change it however they want. But that doesn't mean the players enjoy it - or even that it makes sense or is consistent with any/all of the other aspects of the game's design. 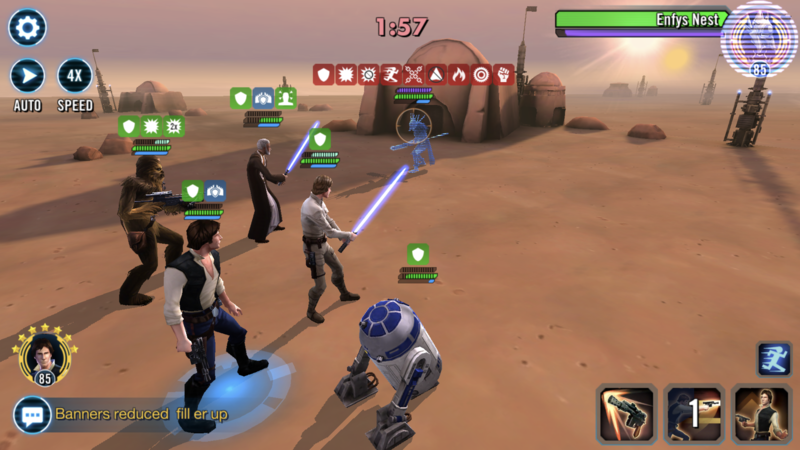 Technically, given enough buffs/debuffs to dispel, Boba can one-shot anyone. This isn't a great argument.